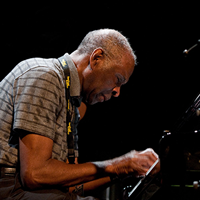 Muhal Richard Abrams has been in the forefront of the contemporary music scene for well over forty years. Muhal is a co-founder of The Association for the Advancement of Creative Musicians (AACM), founder of The AACM School of Music and President of The Association for the Advancement of Creative Musicians, New York City Chapter. Muhal was the first recipient of the grand international jazz award, “The Jazzpar Prize”, which was awarded to him in 1990 by the Danish Jazz Center in Copenhagen, Denmark.. In 1999 Muhal was presented a proclamation by Richard M. Daley, Mayor of the City of Chicago, declaring April 11, 1999 as Muhal Richard Abrams Day in Chicago. Some recent compositions of Mr. Abrams are: Transversion I OP. 6 for Symphony Orchestra, “NOVI” For Symphony Orchestra and Jazz Quartet, Variations for Solo Saxophone, Flute, and Chamber Orchestra, commissioned by the City of Chicago for the 1982 New Music America Festival; Quintet for Voice (Soprano), Piano, Harp, Cello, and Violin, commissioned by The Kitchen and performed at Symphony Space in April, 1982; Improvisation Structures I-II-III-IV-V-VI performed in a series of six solo piano concerts for the 1983 New York State New Music Network Tour; TRIO,x a three-part composition for solo piano, performed at the New Music America Festival in 1984 in Hartford, Conn. July, 1984, and hosted by Real Artways; xOdyssey of Kingx performed by The Brooklyn Philharmonic Chamber Orchestra at Brooklyn’s Botanical Garden, February, 1984 and “Celebrate Brooklyn” at the Prospect Park Bandshell, Brooklyn, New York on June 23, 1984; “String Quartet #2” was performed by The Kronos String Quartet on November 22, 1985 at Carnegie Recital Hall in New York City; xPiano Duet #1x performed by Ursula Oppens and Frederic Rzewski for Music at the Crossroads on February 11, 1986, and sponsored by The Philip Morris Co. at the Whitney Museum; xSaturation Bluex performed on March 14, 1986, by The Brooklyn Philharmonic Orchestra Chamber Ensemble at Freeport High School, Freeport, NY, Tania Leon, Conductor; “Folk Tales 88′” commissioned by The Brooklyn Philharmonic and performed by The Brooklyn Philharmonic Orchestra at Fort Hamilton Base, Brooklyn, NY on July 9, 1988, Tania Leon, Conductor; “Transversion I OP. 6” performed February 22 & 23, 1991 by The Detroit Symphony Orchestra at the Unisys Corporation Classical Roots series in Detroit, Michigan; “What A Man” commissioned for the Black Repertory Ensemble by the Center for Black Music Research, Columbia College Chicago and the Friends of the Chicago Public Library in honor of the Late Mayor Harold Washington and to commemorate the opening of The Harold Washington Library on October 7, 1991; “The String Quartet III” commissioned by Bang On The Can and performed by The Cassatt String Quartet in May, 1992; “Strings and Things” commissioned by The String Trio of New York in 1992, “Saxophone Quartet 1” commissioned by The Rova Saxophone Quartet in 1994; “New Horizons” commissioned by New Band in 1995; Duet for Violin and Piano, commissioned by the McKim Fund in the Library of Congress, 1996; “Impressions 1” commissioned by The Association for the Advancement of Creative Musicians and performed in 1997 by The SEM Ensemble, Petr Kotik conductor. “Tomorrow´s Song, As Yesterday Sings Today” commissioned by the American Composers Orchestra, Dennis Russell Davies Director; with the generous support of Francis Goelet; “Baritone Voice And String Quartet” commissioned by Thomas Buckner and performed at Merkin Hall in New york City on February 25, 1999; “2000 Plus The Twelfth Step” commissioned for The Carnegie Hall Jazz Band; Jon Faddis, Music Director, by The Carnegie Hall Corporation. The world premiere was given at Carnegie Hall, New York City on Thursday, March 18 1999.